Home › Best-Sellers › Astx Extreme Automatic Chicken Coop Pop Door Opener By Chickenguard ..
Astx Extreme Automatic Chicken Coop Pop Door Opener By Chickenguard .. Integrated Timer and LUX Sensor for total control. Manually Control the door with a simple press of the button. Door closed indicator visible up to 100 yards away. 4 kg - 8 lbs door lifting capacity. Imported direct from the United Kingdom we bring you our next Best Sellingdoor opener, the ASTx Extreme. Combining the same great feature set as ourPremium model, we have included the upgraded motor with a wopping 4kg/8lbscapacity and military graded production and encapsulation techniques ensuringcontinued use even in the harshest of environments. We have combined all ofthe great features available on the ASTi Premium model, but have ruggedisedthe electronics to military grade specifications, fully encapsulated thecontrols electronics in epoxy resin and increased the motor capacity up to4kg/8lbs. Running on only 4 x AA batteries, our ASTx Door Opener has beendesigned with ease of use in mind. Depending on frequency of use, will run forapproximately 6 months to a year before it needs new batteries. 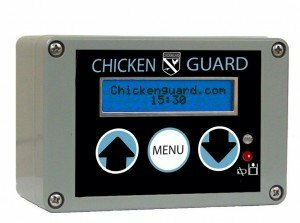 Simply securethe Control Box to the front of your coop, set your Opening and Closingpreferences and your away. We have even made the buttons extra big so that youcan easily press them with gloves on in the winter!As we all know, days getlonger and shorter throughout the year so if you were to use only a timer toclose the door, you would have to adjust the closing times at least twice amonth to keep pace with length of the day-if you forget, you might find thatyou're little darlings get locked out! Integrated Timer and LUX Sensor fortotal control. Configurable fail-safe mode - closes door at a programmabletime even if it is still light. Manually Control the door with a simple pressof the button. Easily adjustable LUX sensitivity to vary when the door opensor closes when using the LUX sensor. Fully featured LCD Display for ease ofuse. Integrated system test functionality Extended working temperature -20 Fto 120 F. Door Closed Indicator visible up to 100 yards away. Low BatteryWarning indicator. All in one design. Long Battery Life. No complicated wiringor cabling. 4 kg - 8 lbs door lifting capacity. Full 3 year warranty.